What, you might ask, is that little piece of biomatter next to that dime? We're kind of afraid to tell you. YOU ARE BIDDING ON A VERY UNIQUE PIECE OF SPORTS MEMORABILIA. 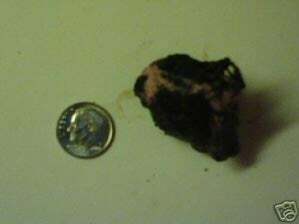 THIS IS AN ACTUAL GAME USED PIECE OF CHEWING TOBACCO CHEWED BY RED SOX MANAGER TERRY FRANCONA DURING GAME 1 OF THE 2007 WORLD SERIES AT FENWAY PARK VERSUS THE COLORADO ROCKIES. THE PIECE OF TOBACCO IS INTERTWINED WITH A PIECE OF BUBBLE GUM. SEVERAL PICTURES ARE POSTED BELOW AS PROOF OF THIS ITEMS AUTHENTICITY. THIS ITEM WAS TAKEN RIGHT FROM THE SEAT OF TERRY FRANCONA AS SEEN IN PICTURE 4. A PORTION OF ALL PROCEEDS WILL BE DONATED TO THE JIMMY FUND. Bidding is at 100 bucks (plus 30 bucks shipping, for some reason; does it count as hazardous material?) and ends Saturday. We're not sure where you'd put this in your home, but please keep it away from children and small dogs.